Legendary Resistance (3/Day) If the dragon fails a saving throw, it can choose to succeed instead. Bite. Melee Weapon Attack: +11 to hit, reach 10 ft., one target. Hit: 17 (2d10 + 6) piercing damage. Claw. Melee Weapon Attack: +11 to hit, reach 5 ft., one target. Hit: 13 (2d6 + 6) slashing damage. Tail. Melee Weapon Attack: +11 to hit, reach 15 ft., one target. Hit: 15 (2d8 + 6) bludgeoning damage. Frightful Presence. Each creature of the dragon's choice that is within 120 feet of the dragon and aware of it must succeed on a DC 16 Wisdom saving throw or become frightened for 1 minute. A creature can repeat the saving throw at the end of each of its turns, ending the effect on itself on a success. If a creature's saving throw is successful or the effect ends for it, the creature is immune to the dragon's Frightful Presence for the next 24 hours. Breath Weapons (Recharge 5–6). The dragon uses one of the following breath weapons. Acid Breath. The dragon exhales acid in an 60-foot line that is 5 feet wide. Each creature in that line must make a DC 18 Dexterity saving throw, taking 54 (12d8) acid damage on a failed save, or half as much damage on a successful one. Slowing Breath. The dragon exhales gas in a 60-foot cone. Each creature in that area must succeed on a DC 18 Constitution saving throw. On a failed save, the creature can't use reactions, its speed is halved, and it can't make more than one attack on its turn. In addition, the creature can use either an action or a bonus action on its turn, but not both. These effects last for 1 minute. The creature can repeat the saving throw at the end of each of its turns, ending the effect on itself with a successful save. Wing Attack (Costs 2 Actions). The dragon beats its wings. Each creature within 10 feet of the dragon must succeed on a DC 19 Dexterity saving throw or take 13 (2d6 + 6) bludgeoning damage and be knocked prone. The dragon can then fly up to half its flying speed. Copper dragons dwell in dry uplands and on hilltops, where they make their lairs in narrow caves. False walls in the lair hide secret antechambers where the dragon stores valuable ores, art objects, and other oddities it has collected over its lifetime. Worthless items are put on display in open caves to tantalize treasure seekers and distract them from where the real treasure is hidden. The dragon chooses a point on the ground that it can see within 120 feet of it. Stone spikes sprout from the ground in a 20-foot radius centered on that point. The effect is otherwise identical to the spike growth spell and lasts until the dragon uses this lair action again or until the dragon dies. The dragon chooses a 10-foot-square area on the ground that it can see within 120 feet of it. The ground in that area turns into 3-foot-deep mud. Each creature on the ground in that area when the mud appears must succeed on a DC 15 Dexterity saving throw or sink into the mud and become restrained. A creature can take an action to attempt a DC 15 Strength check, freeing itself or another creature within its reach and ending the restrained condition on a success. Moving 1 foot in the mud costs 2 feet of movement. On initiative count 20 on the next round, the mud hardens, and the Strength DC to work free increases to 20. Magic carvings of the dragon’s smiling visage can be seen worked into stone terrain and objects within 6 miles of the dragon’s lair. 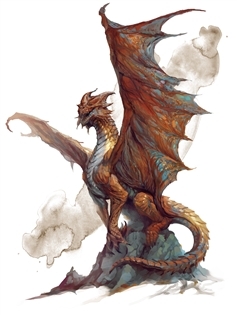 Tiny beasts such as rodents and birds that are normally unable to speak gain the magical ability to speak and understand Draconic while within 1 mile of the dragon’s lair. These creatures speak well of the dragon, but can’t divulge its whereabouts. Intelligent creatures within 1 mile of the dragon’s lair are prone to fits of giggling. Even serious matters suddenly seem amusing. If the dragon dies, the magic carvings fade over the course of 1d10 days. The other effects end immediately.